The City of Encinitas is now accepting applications from Encinitas high school and college age students and adult artists to participate in a city-funded public art project to create mosaic panels for permanent installation. As part of the Caltrans North Coast Corridor Program, the Interstate 5 undercrossing, located at Santa Fe Drive, has been redesigned and a series of 53 mosaic panels will be installed on the north and south walls. The mosaic panels will be created by Encinitas students and adult artists and reflect the culture of the five different communities of Encinitas. Artistic Theme: Encinitas Up Close. · Local flora and fauna, including people. · Abstract or representational in form. · The mosaic must be dynamic and distinguishable from a distance. · The use of text in the design is not preferred. WE NEED DESIGNS THAT DEPICT ENCINITAS HERITAGE: KUMEYAAY AND EARLY SETTLERS, HORSES, LIVESTOCK, SKATERS, BICYCLISTS, CITY LIFE, AND OLIVENHAIN. Two applications are available: Student Artists and Adult Artists. Hard copies are available at Encinitas City Hall, located at 505 S. Vulcan Avenue, or the Encinitas Library, located at 540 Cornish Drive. DEADLINE EXTENDED: the deadline to submit an application is Thursday, November 15, 2018 at 4:00 P.M. to the City of Encinitas Parks, Recreation and Cultural Arts Department. Artist Mentors, who are willing to assist students artists in creating their mosaic, are also being sought. Interested artists are requested to email Jim Gilliam. Artist Mentors may be from any nearby city. Applications will be evaluated by the Commission for the Arts and a recommendation will be forwarded to Caltrans for its review and approval. The commission will then forward the recommendation to the Encinitas City Council for its consideration and approval. Fabrication of the mosaics will commence in early 2019; installation is slated for late summer 2019. For more information, please contact Arts Program Administrator Jim Gilliam at (760) 633-2746 or [email protected]. 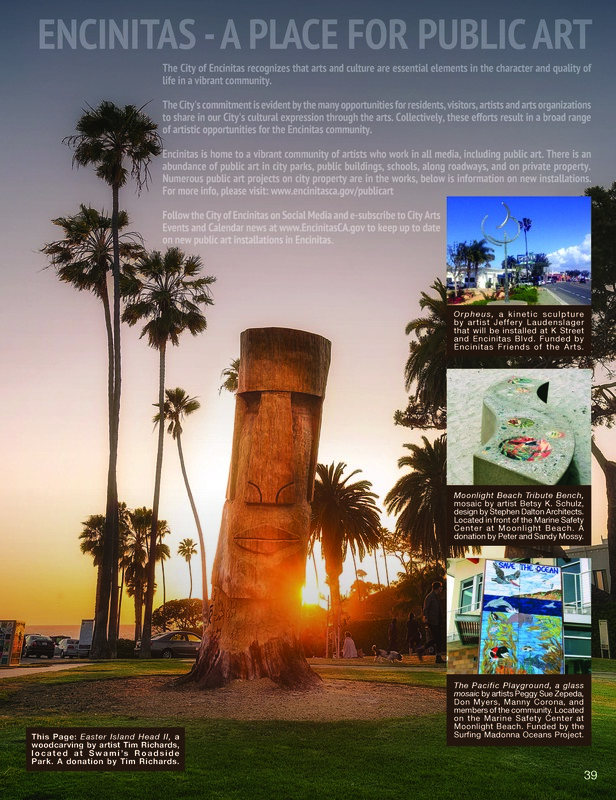 Encinitas is home to a vibrant community of artists who work in all media, including public art. There is an abundance of public art in city parks, buildings, schools, along roadways, and on private property.